This site is hosted by Dreamhost - use the promo code LESS55 to get $55 off any plan costing over $100, like two years of 20GB/1TB for only $7.95/mo, and $27.50 off of less expensive plans. For this initial assignment I have chosen a couple of researchers who would potentially be called scientists rather than artists by many people. However, like Leonardo DaVinci or Albert Einstein, I disagree that these two categories are separate and distinct entities, but rather two ways of approaching the same goal, a deeper understanding of life and Nature. Mandelbrot in fact directly addresses this fact in his book, saying that "clearly, competing with artists is not at all a purpose of this essay," but much as in the case of Daniel Rozin, who also has said that he did not set out in the beginning with the goal of being an artist, I think Mandelbrot is an artist of the best kind, an accidental artist. In reading about development of the generative mathematical theories upon which much of generative art is based upon, the accident seems to be the most important aspect. Dr. Edward Norton Lorenz, one of the founders of chaos theory as we know it, stumbled upon his initial discovery in the field completely by accident, noticing that rounding errors in a punch-card based computer weather simulation were causing drastically different results, countering common rationale of the day. Upon further research he realized that he had discovered the notion of the strange attractor and coined the term butterfly effect, which says that tiny, immeasurable effects in the atmosphere (such as the flap of a butterfly's wings) have the ability to cause huge changes in the future, due to the chaotic nature of the environment. 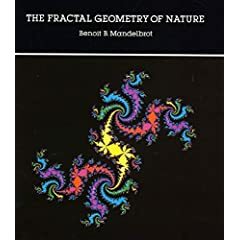 Many scientists study these systems for practical gain, attempting to predict the weather or the trends of the financial markets, but both Mandelbrot and Wolfram are fascinated, if not obsessed, with the idea of using new types of mathematics to better describe Nature for what seem to be more fundamental, purely scientific and artistic reasons. This science is science for art's sake. What does this mean for us? Well first of all, that complex and beautiful behavior can be modeled by comparatively simple rules and programs. 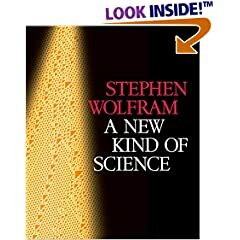 Wolfram posits that most of traditional mathematics is aimed at shortcutting the computational needs of simulating relatively simple behavior. Need to predict the trajectory of a ball in space, neglecting air resistance. Then you can use simple formulas or perhaps derive your own with some simple integration. As soon as things start to get interesting, however, these techniques break down and other techniques are required, usually involving more brute-force computer simulation. The interesting thing though is that often the mathematical requirements aren't that steep, but what is needed is simply more CPU time to run the same code over and over again. It seems so easy for nature to produce forms of great beauty. Yet in the past art has mostly just had to be content to imitate such forms. But now, with the discovery that simple programs can capture the essential mechanisms for all sorts of complex behavior in nature, one can imagine just sampling such programs to explore generalizations of the forms we see in nature. Traditional scientific intuition--and early computer art--might lead one to assume that simple programs would always produce pictures to simple and rigid to be of artistic interest. But looking through this book it becomes clear that even a program that may have extremely simple rules will often be able to generate picture that have striking aesthetic qualities--sometimes reminiscent of nature, but often unlike anything ever seen before. In any case, this New Kind of Science is a fascinating artistic resource that is still mostly untapped, and the next great mistake lies waiting around each corner. Working on these types of problems from any perspective certainly feels more like an exploration of an unknown land than studying or working through mathematical proofs. I am looking forward to experimenting further with these systems both for art and understanding. In this session (my first in the class) we discussed the definition of "generative art" and saw examples brought in from other students in the class of what they believed to be generative artists, discussing whether or not we agreed with their assessment. It was a very useful session, as I left with a much broader view of the field, encompassing many projects beyond the traditional fractals, cellular automata, and the like. As such, I decided to forego my presentation of Wolfram and Mandelbrot in favor of a quick demo of my previous work with Chua's oscillator as art form. For the class, I hope to execute a simulation of the northern lights (Aurora Borealis) for my father's streetlamp art piece. 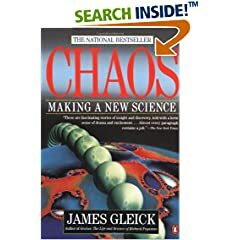 This book was the beginning of my fascination with chaos theory and related topics. Not overly technical, it focuses more on history of the field and why it is relevant for the future. Definitely a recommended read. - Take the corresponding word off the board. - Take the corresponding word off the board. Then either put the two words back as they were, or exchange their positions. Pass the action to the person sitting next to you.